Helge Scherlund's eLearning News: Flexible Learning handbook available for download now! Flexible Learning handbook available for download now! 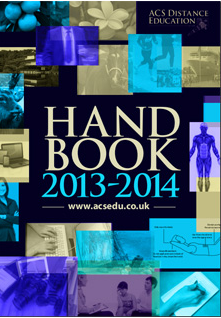 The new course handbook has been released for ACS Distance Education for 2013. The handbook introduces our comprehensive range of courses. With over 400 distance education courses covering such a wide array of topics, this handbook is an essential compendium for anyone interested in further studying. Some of the areas that ACS Distance Education courses include are gardening, horticulture, environmental studies, agriculture, psychology, health, leisure and fitness, animal care, science and business. Our distance courses are flexible to suit our students’ busy lifestyles, and our courses can be taken online, via correspondence or e-learning. Our courses are the result of continuous input from tutors, students and industry over a period of more than 25 years. The input has come from formal channels (e.g. advisory committees, industry reports, student and employer surveys, etc), and informally, by alterations/improvements being made to course notes whenever an improvement is required. Established in 1979, ACS Distance Education is a leading Australian Distance Education provider which offers over 400 courses via correspondence, online or on CD. The Institution has offices in Australia and the United Kingdom, and ACS courses are delivered worldwide through our network of affiliates. The ACS head office is located on the Gold Coast. ACS has educated thousands of full and part-time students, many of whom have gone on to successful employment, both in industry or in their own businesses. Others have used their courses to develop a hobby, or simply broaden their general education. We currently have over 3000 students enrolled from Australia and around the world. The school employs staff in three states of Australia, plus the U.K. and New Zealand. As such our courses and service have a truly global focus. The courses have been developed with strong industry input from around the world and are continually updated on the basis of surveys undertaken by both current students and graduates every month of the year. The school holds high the ideals of practical education, emphasising in all courses those things which are relevant to "real life". Courses offered cater for hobby interest through to formal training in industry and the professions.